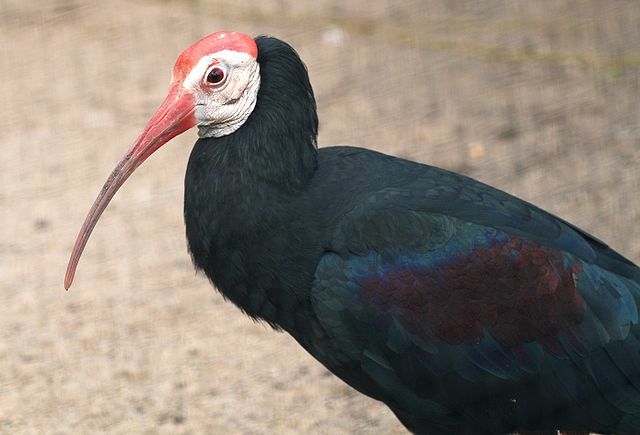 I'd heard of the Northern Bald Ibis for a while before that "Bald as a Coot" post but it wasn't until I did some further research that I realised what probably ought to have been obvious from the start: there is a Southern Bald Ibis. It's very gratifying to see that while there are similarities to its close, Northern relative, it looks strange in a completely different way. It's easy to confuse Sawfish with Sawsharks. They're both flat and have an all round similar profile but worse of all, they both share a feature that looks like it shouldn't exist at all, let alone twice. This, of course, is the eponymous saw. It serves them both as a crippling weapon used to cut and slash prey with sideways swipes and strikes. Scary! For the rest of us? Scissors, knives and saws, never run with any of them. Hmmm... "Common Stinkhorn". What does that tell us? I suppose it tells us that this thing is common. Good start. Perhaps it also tells us that it stinks? I suppose that's quite possible, a lot of things are deemed offensive by our tender nostrils. Does it... does it also tell us that it's... horny? Surely not! Surely that's just a vulgar thought that crept out from some filthy crevice of my own sordid mind. Let's look beyond my dirty, little brain and look to what the sober observations of scientists say. 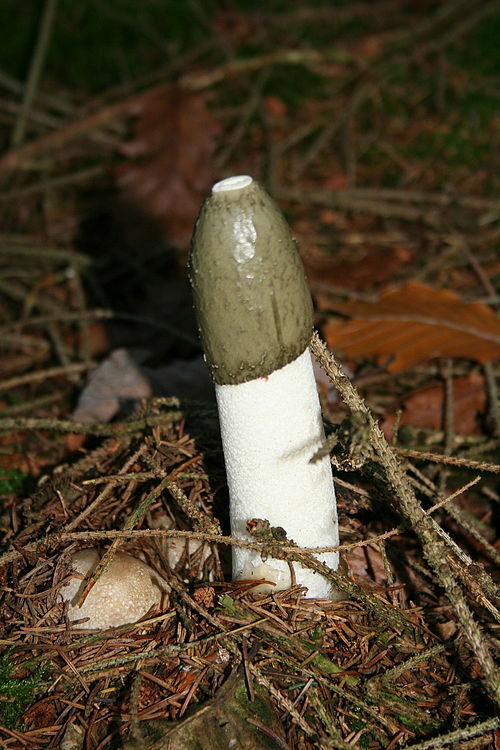 The scientific name for the Common Stinkhorn is Phallus impudicus. "Impudicus" comes from the Latin for "shameless". And "Phallus"... I see. Real Monstrosities has reached the grand old age of 1 today! 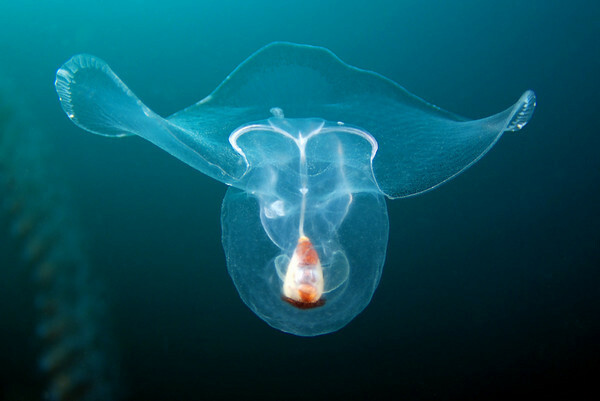 It's one year (and 12 hours) since I clicked on that all important PUBLISH button having first put fingertip to keyboard to write all about the Deep Sea Anglerfish. That was not so long after my first time ever seeing a real one in a jar and being amazed at how tiny it was. 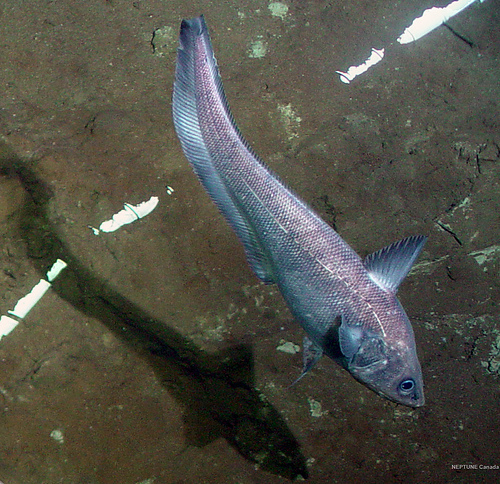 Of course, there are loads of Deep Sea Anglerfish and they aren't all so small. We'll see more about them all some day. Anyway, I'm quite amazed that I've managed to last this long. I'm usually one of those fellows who's really great and committed to stuff for a while and then just, sort of... stop. This time, I eventually set myself a blogging schedule that I've managed to stick to all the way up until now. I really didn't think I would have it in me! I've seen other blogs that go through some retrospective of the year. I don't know... all I'll say is that I've had ups and downs. Downs usually coming right after the ups, but usually not going quite so far down as before. Progress, basically. Which is nice, really, really nice. I'm not, like, all crazy with ambition, but neither am I "blogging for myself and if anyone reads it, that's a bonus". Nope. People reading it is mandatory. So thanks for reading it! Thank you to all the glancers, readers, subscribers, commenters, linkers, sharers and passers-by (who I guess won't see this) who have all contributed to Real Monstrosities over the past year. You are all very much appreciated and keep at bay the gnawing jealousies and dark thoughts of abject futility! Woo! Pacific Spiny Lumpsucker? What on Earth? Did someone just pick some words at random from a bag and throw them together to make a name? Apparently not. 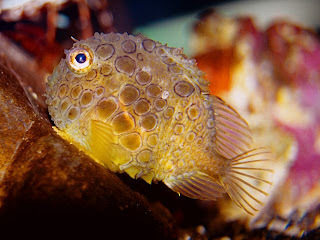 The Pacific Spiny Lumpsucker is one of those odd little creatures that merge the utterly adorable with the downright ugly to create something marvellously intriguing. Treehoppers are small insects, true bugs most closely related to cicadas and leafhoppers. There are over 3,000 species found in every continent in the world aside from Antarctica. Lots of them are green or brown, camouflaged against the plants they spend their time on. It's always a bit odd when you come across something that doesn't appear to have a head. 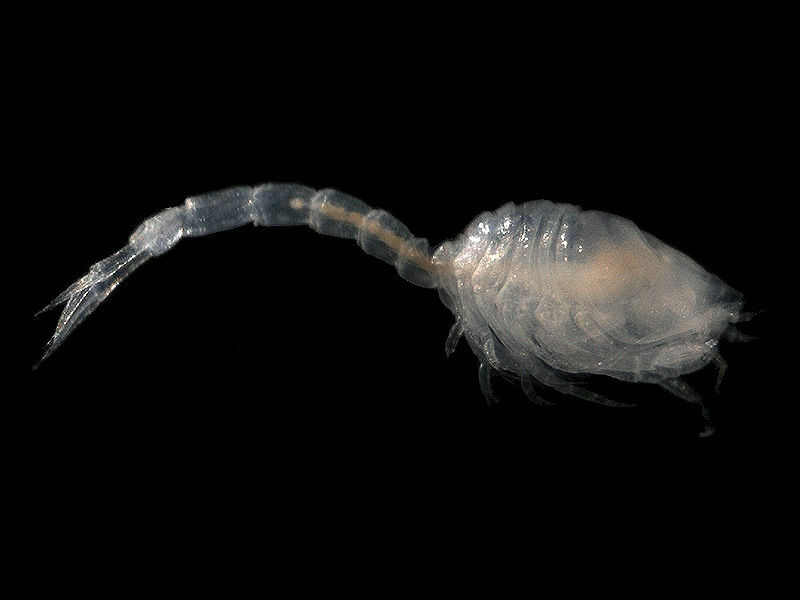 Hooded Shrimps seem to be missing a whole load of legs as well, not to mention some simple details of something on half its body. It looks like a weird seed on the end of a weird stem. Crinoid. Attack of the Crinoids. The Intergalactic Crinoid Empire. It sounds like the baddies in a computer game where you destroy an entire civilization of barbaric, technologically advanced, Earth threatening aliens using nothing but a single, rather small space ship, all to the soundtrack of toe-tapping techno which makes you nod your head but with a down-turned mouth because you're enjoying it in a serious and urban way. The Big Red Jellyfish... is a big, red jellyfish. Well, that's it for this extraordinary animal. Thanks for visiting Real Monstrosities on this fine day and please come back soon for more! Terrible news, everyone! The Earwig does NOT crawl into people's ears at night and lay eggs in their brain! Oh no! This must be a confusion with... is there anything that actually DOES crawl into people's ears at night and lay eggs in their brain? I wouldn't actually discount it. 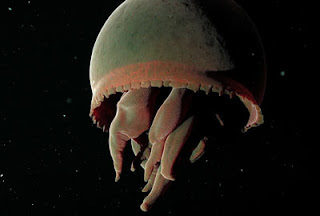 If the youtube comments section of almost every single nature video has taught me anything, it's that the annoyingly constant "damn nature, you scary!" refrain is often true. The even more annoying allusions to Pokemon, however, have no excuse. No excuse whatsoever. Earwigs do like cool, moist hide-outs, though. The word "earwig" comes from the Old English for "ear beetle", so maybe an earwig crawled into the ear of some king or chieftain one night and he told absolutely everyone about it. Or perhaps, in the old days, when people lived in hovels made of wood and animal skins or whatever, it might have been quite a common occurrence. I don't know. Fact is, ears aren't a great place for earwigs. I doubt it's anything personal, they just don't think of you in that way. Friends? Friends. Coots are lovely water birds that can be found all over the world in lakes and ponds. There are about a dozen species overall, most coming from South America, but almost everywhere has at least one. Perhaps part of their success is their omnivorous diet? They can dive underwater in search of plants and insect larvae or forage on land for fruit or other bird's eggs. Their huge, strong, partially webbed feet allow them to plough through water or stride across land with equal ease. The bald patch may not be quite so useful. 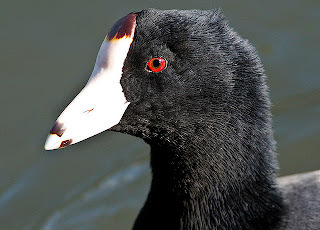 Coots are almost entirely black but on their forehead, right between the eyes is a bright, white shield that connects with an equally bright, white beak. It's for this that we get the expression "bald as a coot." But the coot is far from being the only bald bird, in fact it's hardly bald at all compared to the ones we're about to look at now. And not a single one is a vulture! We've already seen vultures. All of them. We're still recovering. So, balder than a coot. Let's see what we see. This creature is utterly extraordinary! I should say that "shocking pink" is the name of the colour, presumably because it's at the very least unexpected. I'm a boy so I also think it's garish, ghastly and queasy, altogether yucky just like girls are because they give you the lurgies. It's also completely mad to think that this millipede was first described in 2007 by scientists in Thailand. 2007? Did no-one notice it before? 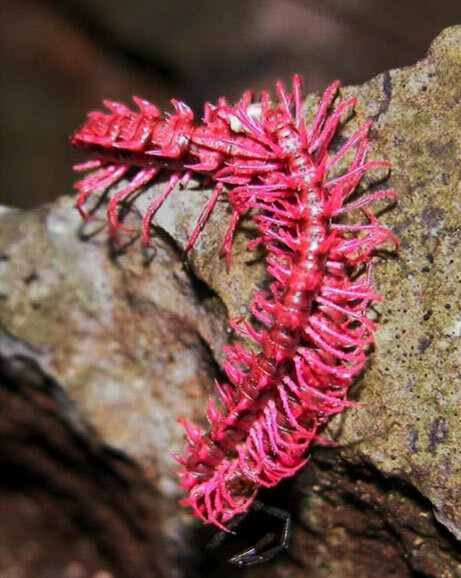 I would've thought that pretty much anything of this colour would feature in ancient myths somehow, even if it's just a cameo shoehorned in to remind everyone of that time they saw that crazy thing crawling about the place like it was normal. Grenadiers were first established during the 17th Century where particularly big, particularly strong soldiers were chosen to throw olden day grenades, which I guess were really heavy back then. Having gotten used to standing right at the front of the front line, lighting grenades and then waiting to throw them at just the right time such that the baddies on the other side couldn't just throw it right back, grenadiers became elite troops and leaders in battle even after the whole grenade thing became less important.